Amdowas love their noodles. Noodles in soup in the winter days and cold noodles in the summer time. My husband laughs at how much I love noodles – I guess it’s the strength of the Amdo half of my genes because I do have an insatiable appetite for homemade noodles. 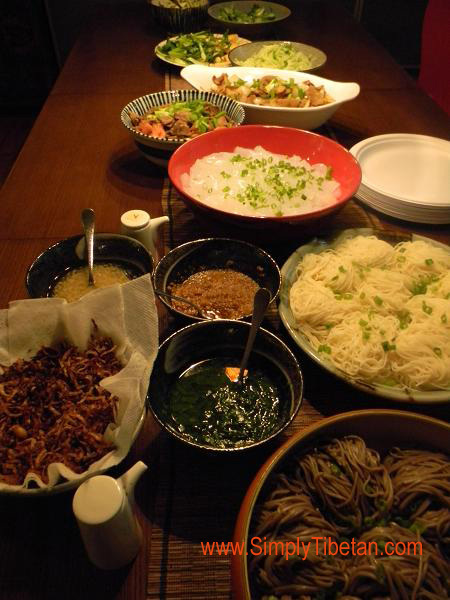 And as warmer days are coming, drang-thuk or cold noodles come to mind. 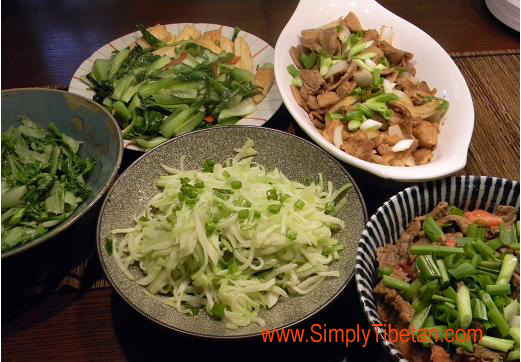 In preparing Drang-thuk, the most important things are the condiments and most families have their own style of preparing these condiments. In our home, we prepare Gogpa (a garlic dressing), and Tsong-qa (fried onions) – sometimes, I also make a chive dressing, and of course hot sauce, soya sauce and siling tsu (chinese rice wine vinegar). The condiments are left on the side for each guest to add according to their taste. 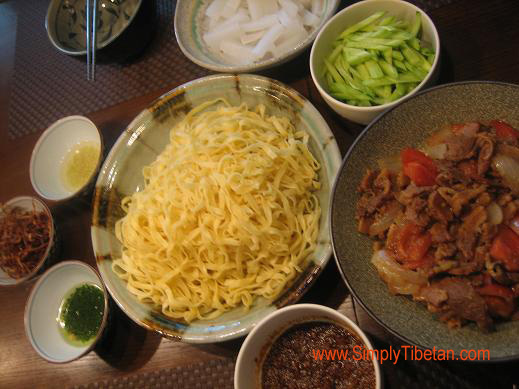 With the cold noodles, we’ll usually serve Shaptak (stir fried beef) or phagsha (stir fried with some veggie), Lephing (Mungbean gelatin), veggies or a salad. 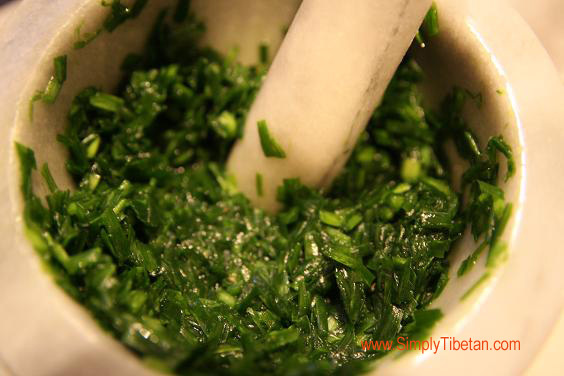 The main ingredient for drang-thuk is of course, the noodles and then the garlic dressing. When we were little, we would be given the job to prepare the garlic. My grandmother always told us this was the children’s job and that her mother used to have her prepare the garlic as a child. I don’t know how useful we were but we crushed a lot of garlic for our folks, and we ate a lot of it in everything … even in thenthuk – swoooosh, a spoonful of the garlic dressing would be added. One the days that we make fresh hand pulled noodles, then we will of course eat one bowl of the pasta with only the garlic dressing – to fully appreciate and experience the taste of the pasta. This is when you realize that Amdowas are real foodies – and coming from a farming community, my grand mother taught us to appreciate good wheat early on. 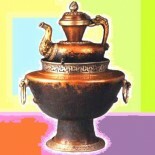 Drangthuk can be made very simple or more elaborate with more sides of meats and veggies to accompany it. Here’s one version of a simple lunch for us at home. Drang-thug with just some chopped cucumbers, lephing and shaptak. I used Cheetse (ribbon pasta). Here’s a grander version – for one of our dinner parties. This is actually very convenient for summer gatherings as the noodles and condiments can be prepared ahead of time, and the rest can be pulled together quite fast. I made two meat dishes and a variety of veggies to go with the noodles. 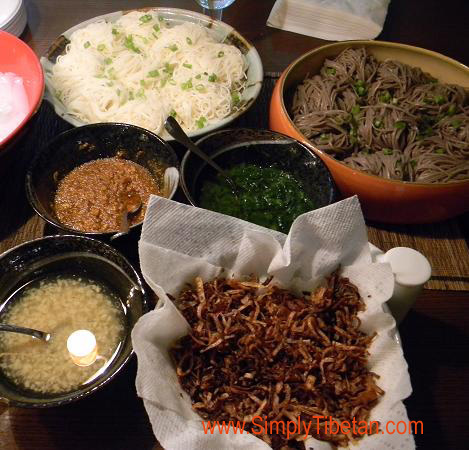 For noodles, I prepared two types – regular wheat noodles and soba noodles for the healthier version. All in all – with all the various condiments, my son puts it aptly when he says this drang-thuk dish is a real “taste bomb.” So many intense flavors and all of it adding extra texture, flavor and aroma . Just Yummmmm. Put about 8-10 cloves of garlic in a mortar & pestle and work them until they are completely mushy. Spoon the mixture out into a small bowl. Add a pinch of salt. Now heat a small amount of oil and pour the hot oil over the garlic in the bowl. The garlic will sizzle and giving out delicious aromas. This is your basic garlic dressing. If you don’t like too much garlic, you can dilute this by adding a small amount of boiling hot water. 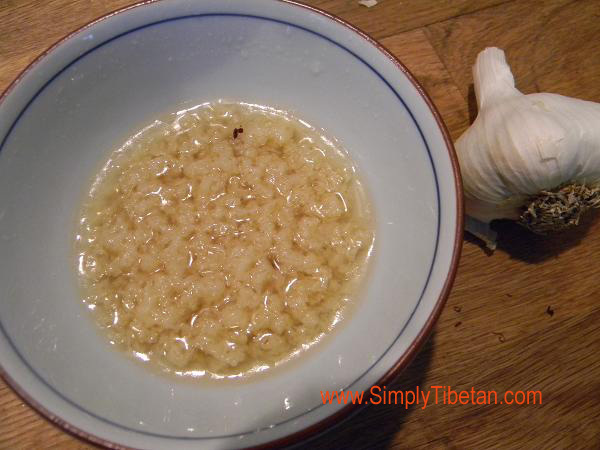 The hot water mixes with the oil and garlic and dilutes it. Do not use cold water as it will not mix with the oil. Cut the onion into half or quarters and then thinly slice them. Put the sliced onions on a paper towel or clean cloth to dry them out. 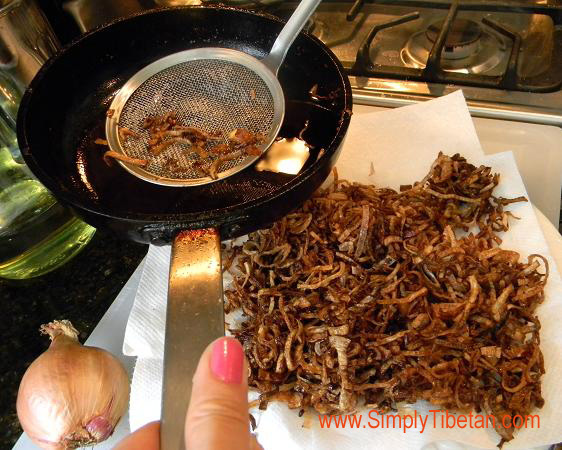 Heat a ¼ cup of oil in a small pan – to deep fry the onions in small batches. Fry them until a nice golden brown, drain them on paper. Cool and keep it in an air tight container. Take a small bunch of chives, chop them up into small manageable size. Then put them in the mortar & pestle. Crush and grind until it forms a nice paste. Take this out in a small bowl. Add a dash of salt. Heat a small amount of oil and pour the hot oil over the chive paste – it should sizzle and the chive will turn a beautiful bright green color. Heat the oil in a small pan. Put all rest of the ingredients in a medium size bowl – not too small so there is room for the oil. Once the oil is hot but not smoking, then pour the hot oil over the chilli and rest of ingredients. The hot oil will cook through the chilli and garlic giving out a wonderful hot chilli aromas. As the oil cools, mix it the mixture and your chilli paste is ready. This type of chilli sauce is called Su-latsi. Cook pasta to instruction. Add a little oil, mix it nicely and let cool. For drang-thuk, we normally use the thinner, skinny pasta as the thicker udon type noodles tend to feel a bit doughy when eaten cold. Arrange all your sides and dressings on the table. Serve the noodle in a bowl or plate. Each person will add a little bit of all the various dressings on their bowl of noodles, mix it up well and then top with sides of your choice. Please enjoy !! This “Drang-thuk” sounds delicious dish for Summer time. I am for sure going to try it! Thank you for sharing all of these recipes. Can this be made with rice noodles—I have celiac disease and cannot have gluten (wheat, barley, etc.). Thanks—glad to find your blog. Tashi Delek—-Rangzen! Hope you do, Pema la. You are lucky. I hope to travel to Amdo one day. Hi Janet, The chilli powder we use is much stronger than anything you’ll find in new mexican cooking. It is a type of dried hot chilli powder that you will find in Asian stores. The chilli sauce is meant to be a condiment – and you can use as much or as little of it or not at all. This chilli keeps very well, so you can put it in a closed glass jar and leave it the fridge for weeks. Is the chilli powder you use equivalent to the chile powder used in New Mexican cooking, or is it more like cayenne? If the latter, it seems like 1/4 cup would be too much. I had the cold noodles while visiting my husband’s family is Amdo. It was my FAVOURITE dish of the whole trip. Thanks so much for sharing this recipe. 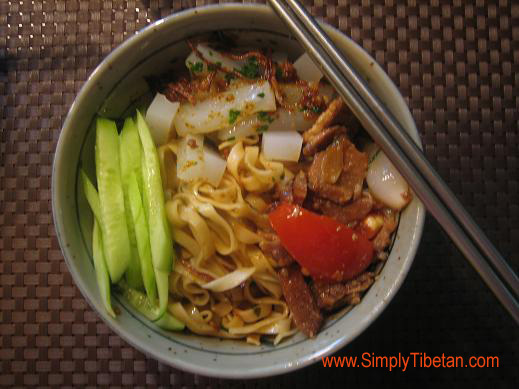 This entry was posted on April 21, 2013 by simplytibetan in Recipes and tagged cold noodle, cold pasta, drang-thuk, garlic pasta, thukpa, tibet food, tibetan, tibetan food, tibetan pasta.